Science Fiction Film, Television, and Adaptation: Across the Screens amalgamates John Ellis’s seminal 1992 Visible Fictions with convergent media studies popularised by Henry Jenkins in 2006. 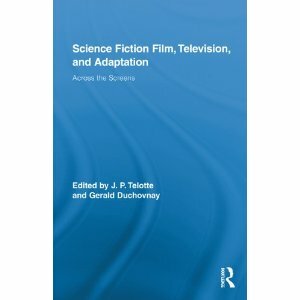 Editors J. P. Telotte and Gerald Duchovnay establish the significance of science fiction (sf) in the introductory chapter allowing the subsequent four constituting parts (each containing three chapters) to outline a number of key theoretical and industrial concerns pertinent to the adaptive journey between film and television. Part One provides a context for such narrative translocation. Cynthia J. Miller’s opening chapter focuses on the segmented nature of 1940s and early 1950s sf cinematic instalments and their ease of migration onto television due to its broadcast structure and budgetary restrictions. J. P. Telotte then discusses The Twilight Zone (1959-1964) and the aesthetic schemes re-appropriated from cinema which generated an early stylistic convergence between film and television. Mary Pharr subsequently uses Voyage to the Bottom of the Sea to demonstrate the two major conflicting elements of the adaptation issue “for it both offered a viable formula for adaptation and underscored the difficulty of replicating a cinematic feel, especially for spectacle, on the television screen” (35). The difficulty of replication and the medium specificities of television is further explored in Part Two. Following Gerald Duchovnay’s discussion of a failed attempt to adapt a successful film (Logan’s Run) into a television show, Sherryl Vint analyses a more successful televisual adaptation, Stargate SG-1 (1997-2007), and its subtle absorption of the film’s structure and aesthetic into a distinctly televisual style. Lorrie Palmer then provides perhaps the most intriguing chapter containing the richest textual example, The Sarah Connor Chronicles (2008-2009). By questioning the wider cultural discourses of television, Palmer considers how the medium cultivates a female warrior figure resulting in gendered imagery dissimilar to the source material. Part Three charts the migration from television to cinema and begins with M. Keith Booker’s exploration of the most iconic of televisual sf, Star Trek (1966-69). Booker argues that, while the first cinematic adaptation was unsuccessful because it relied on cinematic conventions, the second film succeeded because its elements were more thoroughly televisual. Similarly, Rodney F. Hill explores the structural nature of The X-Files (1993-2002) and suggests that the TV programme’s auspicious reception was due to its integration of elements of cinema (episodic) and television (serialised) while the episodic nature of cinema contributed to the adaptations’ underperformance. This section culminates in J. P. Telotte’s exploration of the commercially unsuccessful Firefly’s (2002-03) adaptation onto the big-screen with Serenity (2005); the latter’s generic conventions allowing the text to negotiate thematic concerns – on the mechanisms of viewing and the mediatising power of the vision machine – which were truncated by the programme’s deployment of Western motifs. Part Four introduces production and consumption contexts into the adaptation discussion. Exploring Doctor Who (1962-69, 2005-), Mark Bould postulates that media products are open, polymorphous conflations of other texts continuously reworked by the ongoing context of their consumption. Michelle Onley Pirkle’s subsequent chapter addresses the ways in which Cowboy Bebop’s (1998-99) re-appropriation of generic conventions was abandoned by the cinematic adaptation in order to integrate filmic imagery into the familiar aesthetic of the TV series (much to the dissatisfaction of fans). In the final chapter, a logical conclusion as it considers the most influential sf franchise, Star Wars, Chuck Tryon explores fan adaptations which allow “fans to actively shape the meaning of popular films and television shows” (177) and provides new ways of thinking about the source text. Such practices can, therefore, help us to understand the adaptive process which “demands the media literacy skills of reading and retelling a popular story” (177). Departing from Adaptation Studies’ usual preoccupation with a product’s fidelity to the source material in favour of the bridges between text and media, contributors to this edition combine numerous paradigmatic approaches such as audience interpretative strategies, cultural/textual analysis or production/broadcast policies. However, a number of chapters, such as Telotte’s discussion of Serenity or Hill’s contemplations on The X-Files, seem unsatisfying in their engagement with the book’s central concern of a text’s migration between media screens (which is often marginalised in favour of other thematic conceptualisations). Similarly each chapter, although accessible and encompassing a diversity of narrative strategies, is quite short which precludes the authors from referring to other textual examples. For instance, Duchovnay suggests that the small-screen’s diminutive visual form and wider developments within cinema resulted in the failure of Logan’s Run. However, other contemporaneous broadcasts are not provided as context or confirmation of his assertions. This is understandable given the nature of the book as an overview of sf’s adaptive journey, but a more expansive project would need to provide further examples and consider other media forms like radio, the internet, graphic novels, or secondary texts such as marketing materials which extend the text’s diegesis (the contributions of Mary Pharr and Mark Bould are more comprehensive in this respect). These issues notwithstanding, each chapter provides a rich insight into the “intermedia adaptation process” and clarifies “some of the problems and possibilities inherent in all instances of cross-media adaptation” (xiv). In doing so, this edition focuses engaging critical attention onto the convergence of audiovisual mechanisms and one of narrative’s most innovative genres (science fiction). Vitally, this work also provides a framework to reconceptualise productions within a media literate culture of divergent platforms and modalities of consumption practices. As such, Science Fiction Film, Television, and Adaptation: Across the Screens is a useful resource for those interested in exploring generic forms, myriad media delivery systems or new ways of conceiving media practices. However, as the book’s limited discussions on issues such as Ellis’s “Glance/Gaze” formulation, “flow” or the era of “TVIII” illustrate, this edition would favour those with an existing proficiency in media and an understanding of the historiography of both Film and Television.